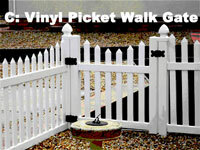 KC Fence & Deck provides vinyl gates for all vinyl fencing styles, including colonial-style, picket and privacy. 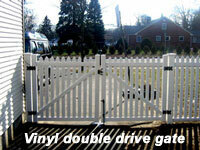 Vinyl fencing and gates allow for very rugged conditions and easy installation, all while adding to the decorative style to your property. 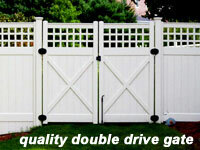 Perimeter of entire gate reinforced with aluminum inside; very heavy duty. Hinges, latches and screws remain rust free. Aluminium stiffeners in the latch and hinge post make hinges adjustable. Both concreted into the ground, the posts remain rigid for accurate gate closure. 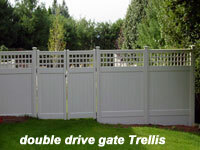 All gates come with fully adjustable hardware with spring loaded hinges that can be activated or deactivated as you choose. 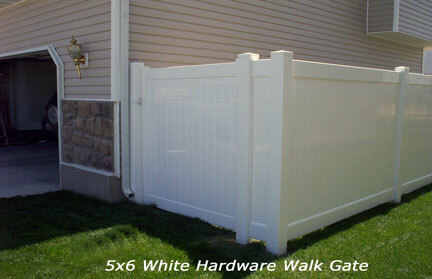 The spring closures are usually required on pool fences.